Send checks and bill statements through the mail securely and privately with these security-tint envelopes from Staples. These envelopes are made from strong 24-pound woven paper, which combines with an interior tint to obscure sensitive information, reducing the threat of theft as your envelopes go through the mail. These #6 3/4 envelopes are just the right size for mailing checks or hand-delivering pay stubs to employees, and the self-sealing flap closes easily and cleanly for a secure hold. These Staples security-tint envelopes offer privacy and protection for your mailed documents. In addition to the convenient EasyClose adhesive flap, they feature an interior tint that prevents third parties from viewing your private materials. Constructed from 24-pound paper for durability, these security envelopes are available in boxes of 100 for convenient restocking. These security envelopes are designed to ensure that your private documents remain private during transportation. The interior tint prevents anyone from viewing the envelope's contents, thus avoiding the compromising of confidential information. It makes these security envelopes an ideal choice for mailing checks, invoices or other sensitive documents. These Staples tinted envelopes use the EasyClose sealing system. Simply peel the paper off the top flap and seal the envelope with the adhesive. EasyClose means there is no need for moistening, gluing or taping these tinted envelopes closed. It provides a tidy, secure seal to ensure that your documents reach their destination undamaged. In addition to the EasyClose strip, these envelopes feature a strong 24-pound paper construction that will protect your documents during transit. 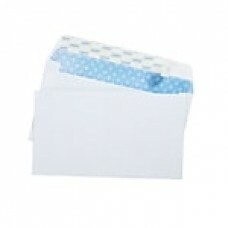 The envelopes' dimensions make them perfect for mailing any kind of brief, private correspondence.